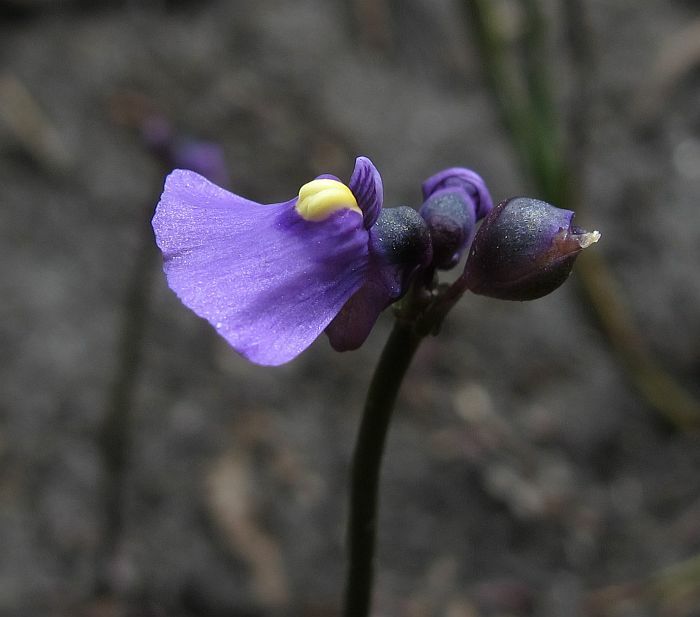 Bladderworts are also known as Fairies Aprons for obvious reasons and come from the insectivorous Lentibulariaceae family. 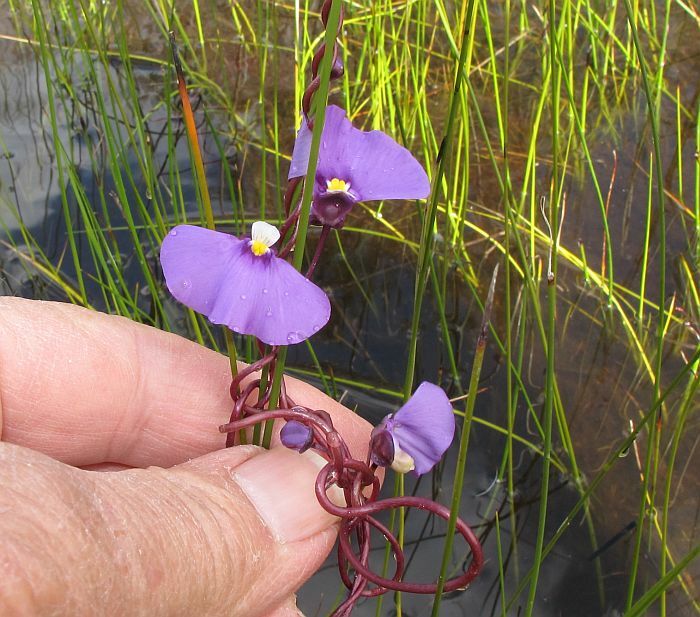 Utricularia volubilis is an impressive perennial twining plant that grows to a metre (over 3’) in height, with large (2 cm or ¾”) purple flowers, but dies back to a corm during late summer, autumn and winter. 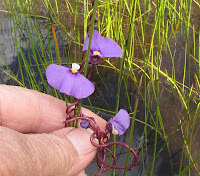 To see them in flower you need gumboots as they are only found in ephemeral swamps, particularly those containing water well into summer, but of additional interest, they commonly grow with the equally large purple flowered Babe-in-a-Cradle Orchid, Epiblema grandiflorum var. 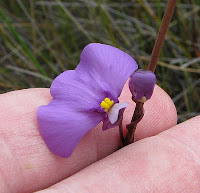 grandiflorum (see post in orchid section). 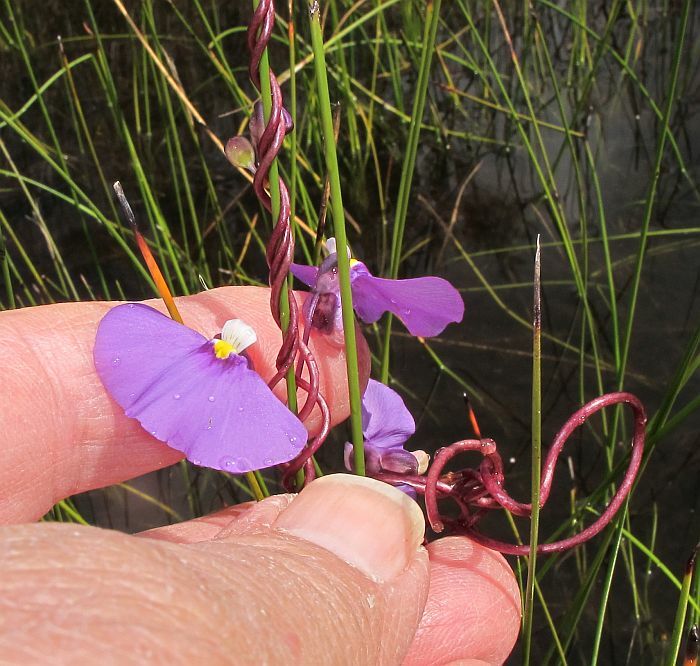 Locally the Twining Bladderwort is only known from a few locations to the east of Esperance in a triangle from Cape Le Grand, Mt. Merivale and Duke of Orleans Bay. The next known occurrence is to the west of Albany (over 400 km or 250 miles away), where equally limited, then in a few scattered populations to Perth. However, I suspect it is far more common, but you need to be looking in the right place at the right time. 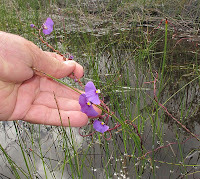 Utricularia volubilis needs periodic bushfires to reduce the build-up of sedges within swamps that will otherwise smother them, although this may take several years, but usually after 5 years they are greatly reduced. As bushfires in the region often span much longer periods, timing is therefore most important. 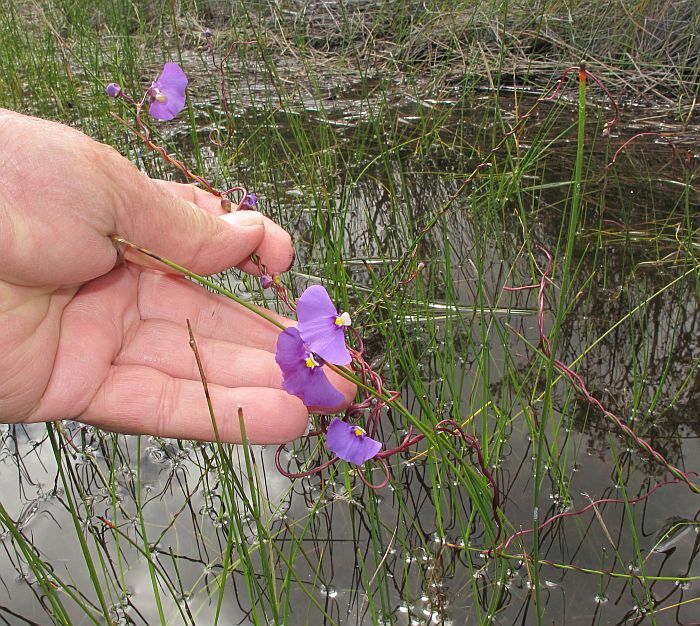 Secondly, very few people, even keen naturalists will wade into swamps on the off-chance of finding something of interest, plus it is not helped by the sparse human population between Albany and Esperance, so not surprising they haven’t been discovered there. 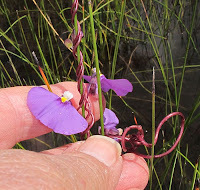 The water level when Utricularia volubilis is flowering is mostly below the knees and often at ankle depth, but the base of the plant with the bladders is usually submerged for most of the year. The bladders are much larger than most other Utricularia spp., being close to 5 mm (nearly ¼”) in length and are well adapted to capture prey in their aquatic environment. The Twining Bladderworts tightly wrap themselves around the sedges and will climb until they reach an open sunny position; there the flowers (usually in pairs) develop and being large, colourful and common where found, can be spotted from some distance, although they may only occur in a small portion of a large swamp. 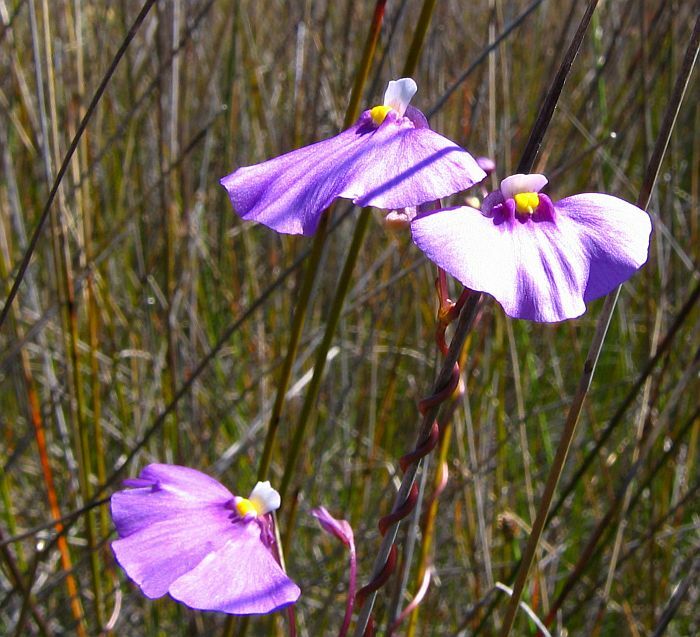 Flowers continue to form from September to December, so for the enthusiastic nature lover, a pre-Christmas ramble in gumboots can be well worth the effort. 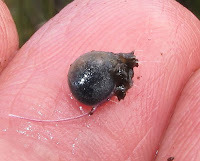 Two photos added and two substituted, one showing a trap with activating hairs.